For those suffering from white kitchen overload, you may want to consider another classic color, black—in particular, dark cabinetry. Black cabinets are an elegant option that feels way more glam than plain white. If you need a little assistance embracing your dark side, you have come to right the place. We share creative ways you can add bold and dramatic black cabinetry to your cooking space. Continue to 2 of 24 below. In this spacious and light-filled kitchen by Texas Construction Company, black shaker-style base cabinets are topped off with a Carrera marble waterfall countertop. What keeps this cooking space feeling light and airy are the walls covered in white subway tile, which offset the dark cabinetry. Continue to 3 of 24 below. Black stained wood cabinetry combined with natural wood accents give this contemporary cooking space by the interior designers at Let's Talk Kitchens a modern farmhouse vibe. Continue to 4 of 24 below. When creating this kitchen, interior designer Susan Cleveland was looking to create a minimalist kitchen with a traditional aesthetic. She got the job done by mixing two different styles of cabinetry. On the wall are black cabinets with sleek, flat fronts. The white base cabinets have a classic shaker profile. Continue to 5 of 24 below. Natural wood accents and a mermaid-inspired backsplash adds warmth and personality to this small kitchen by Design Shop Interiors. Combining the black cabinets with open wood shelves keeps the cooking space from feeling top heavy. Continue to 6 of 24 below. Create a kitchen brimming with warmth and personality with bespoke black cabinetry highlighted by natural wood accents. In this custom cooking space by Space Craft Joinery, a geometric wood tile backsplash sets the chic and thoroughly modern tone for the flat front cabinets. Continue to 7 of 24 below. Black shiplap covered cabinets, and maple butcher block countertops are the critical ingredients in this bohemian-inspired kitchen by Wirth and Company Construction. Sealing the deal on this cooking space's hippie vibe are the two basket weave, bamboo pendant lamps. Continue to 8 of 24 below. In this cooking space by interior designer Nicolaj Bo, black cabinets that resemble living room furniture makes the kitchen feel less conspicuous and less obvious. Continue to 9 of 24 below. Kandra Kole Interiors gave this traditional kitchen a retro lift thanks to red appliances and black cabinetry. The cabinets were personalized with red door pulls. Continue to 10 of 24 below. This gorgeous onyx cooking space by April Tomlin Interiors combines jet black shaker cabinets with moody marble herringbone tile. Metallic accents from the chrome cabinet knobs to brass light fixtures add room brightening contrast. Continue to 11 of 24 below. This DIY modern farmhouse cooking space featured on Maison de Pax combines white shiplap walls, open shelving, and butcher block countertops with midnight black base cabinets. Keeping the walls white makes the compact space feel bigger and brighter. Continue to 12 of 24 below. Inject some old world flavor into your kitchen with ideas from this lovely cooking space by Beatriz da Costa. Black beadboard cabinets give the tiny cooking space a charming country vibe. A black wall becomes the backdrop for a homey, gallery wall. Continue to 13 of 24 below. A stylish black and white kitchen by Sara Ray Interior Design combines open shelving with black shaker base cabinets. Keeping things light above the countertop allow the room to feel crisp and bright. Copper plated bar stools and a brass light fixture bring in a glam aspect to the space. Continue to 14 of 24 below. Black upper cabinets draw the eyes upward, adding visual depth and height to this black and white kitchen by Martha O'Hara Interiors. Continue to 15 of 24 below. Two-tone cabinetry with gorgeous brass hardware add lots of visual interest to this black and white tuxedo-inspired kitchen by Lat Lawton Interiors. The black cabinets against the wall anchor the cooking space. Continue to 16 of 24 below. 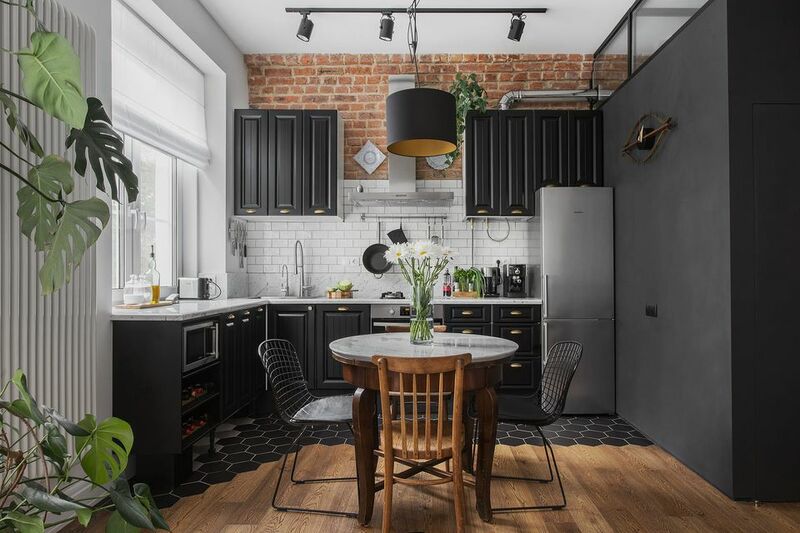 Concrete countertops, subway tile punctuated with charcoal grout, and licorice black base cabinets lend a chic and masculine vibe to this small kitchen by B Garden Designs. Continue to 17 of 24 below. Black cabinets and a warm wood countertop give this tiny cooking space by Dichotomy Interiors a rich and luxurious look. Continue to 18 of 24 below. A sizable kitchen in a mountain home by Studio McGee features bespoke black cabinetry against white walls. Opening shelving in the center of the kitchen wall keeps the huge cooking space feeling light and breezy. Continue to 19 of 24 below. Keeping the black cabinets against the wall and away from the windows throws focus on the stunning greenery outside in this modern kitchen by Sunstone Interiors. Continue to 20 of 24 below. What we love best about black kitchen cabinets is that they can be mixed and matched with practically anything. In this eye-popping cooking space by Jasmin Reese Interiors patterned tile is paired with midnight black cabinetry. A bright blue kitchen island lends a pop of bold color. Continue to 21 of 24 below. Traditional black cabinets can work with a broad range of decorating styles. In this kitchen by M2 Project, they feel downright bohemian against a brick and white subway tile wall in an artist loft. Continue to 22 of 24 below. From the Caesarstone countertops to stunning oven hood, there are lots of drool-worthy features in this spectacular cooking space by Dove Design Studio. But the black cabinetry is what truly enhances this kitchen's elegant appearance. The black farmhouse-inspired china cabinet puts dishware on display, and the sophisticated base cabinets are tricked out with brass cup style pulls. Continue to 23 of 24 below. Just like traditional white kitchens, black cooking spaces, like this example by Gilmer Kitchens, will certainly stand the test of time. Gorgeous shaker style cabinets are topped with crown molding for formal polish. Continue to 24 of 24 below. Kitchen storage practically disappears courtesy of espresso black flat front cabinetry in this modern cooking space by Darren James Interiors. Kitchen Bumpouts: How Hard To Do?